Ask fellow campers about "Mountain View RV Park & Campground" and nearby attractions. Very nice smaller park. We stayed for one night at the very end of the season with very cold temps (down to 15 degrees that night). The water hookups were off, but the owner offered their spigot at the office which was working to fill up our fresh water tank, which was more than enough to get us through the night and morning. Restrooms were seemingly brand new, sparkling clean and heated! Only stayed for one night and would definitely stay again if ever in Sundance, WY again. We camped at Mountain View RV Park & Campground in a Travel Trailer. Would recommend this park for cleanliness, amenities (piped in music in the bathrooms even), game room, small bit of exercise equipment, pool, store and most importantly the owners and their genuine hospitality. We camped at Mountain View RV Park & Campground in a Fifth Wheel. 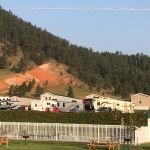 Mountain View is easily accessible from I-90 and makes a great stop-over spot when going across the state. New owners are actively making improvements. Streets through the campground were in good shape. Low hanging branches had been trimmed. Trees are still relatively small, but there is some shade available. Cleanliness and host helpfulness were the top two attributes. We were even greeted with fresh from the oven cookies when we checked in! Restrooms, pool area and store area were immaculate and hosts went out of their way to be helpful. We left trailer in the park while we drove to Devil's Tower and spent the morning, then returned, picked up the trailer and continued our journey. Park makes a good base for touring in the Devils Tower--Sturgis area. We camped at Mountain View RV Park & Campground in a Travel Trailer. Good base to use while visiting Devil's Tower or Sturgis, SD. We were disappointed in steak dinner at steak house in Sundance--but this was no fault of the RV owners. Should have cooked supper myself! This is a park in Sundance, WY, right on I-90. It has gravel driveways and site pads. We had a pull-thru with 50amp electric, water, sewer and a picnic table. There are a few small trees, but our site had none. There is a pool but we didn't use it. The WiFi was adequate for email and some web browsing. The bathrooms are very nice and super clean. We really appreciate RV parks that provide nice and clean restrooms. We paid $43.74 per night. We camped at Mountain View RV Park & Campground in a Motorhome. Dry clean park with very wide roads for easy turning of large motor homes. It's about 1 mile from the town of Sundance. It's about 30 miles from Devils Tower. It is also about 15 miles from Buffalo Jump Saloon where we had the best prime rib we've ever had. The WiFi is not good at all. But that didn't matter too much. I walked all around the area and into town. Very safe, so clean and people waved to me as I walked. The staff is very friendly and we got free homemade cookies when we arrived. The mountain behind the park is a beautiful red. We camped at Mountain View RV Park & Campground in a Fifth Wheel. There wasn't quite enough room for our truck but we were told it was ok to park on the grass. We had planned to stay for a couple of nights but ended up staying for a week. We were taken to our site and assisted with parking. All the staff were extremely friendly. The owners addressed us by our names.The views were spectacular. There is a small grocery store in town and a few good places to eat. We camped at Mountain View RV Park & Campground in a Motorhome. Very nice, quiet park. Stayed here to visit Devils Tower about 22 miles away. Friendly staff. Level sites. WiFi great. 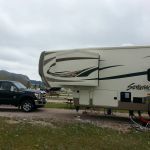 We camped at Mountain View RV Park & Campground in a Fifth Wheel. Visit downtown Sundance and devils Tower. Very easy to find following web site's directions. Interior roads and sites are well maintained gravel. The picnic table was in bad shape due to a recent hail storm. Good WiFi. We would stay here again. We camped at Mountain View RV Park & Campground in a Motorhome. People come here to go to the Devil's Tower which is really amazing, but you must also go to Vore's Buffalo Jump. It's just a few miles east and is awesome! Very knowledgeable and informative guides. It's well worth the $9 per person fee. I think this is the 5th July in a row that we have stopped here on the way west after spending time in the Black Hills. As usual, we had a level, gravel, pull through FHU site on the upper level. We took a pass on the $2 cable TV since our site (an I think most) was satellite TV friendly. Again, as usual, the only problem I have with these upper level sites is that the sewer hookup is right at the entry of the site. The Wi-Fi worked fine for our minimal (e-mail and web surfing) needs. The pool is always enjoyable on a hot day. The renovated laundry and bathroom facilities are very nice. The bathrooms, however, could be inadequate if the park has many tent campers. The new owners seem to be keeping the park up to previous high levels. I still see no recycling. We camped at Mountain View RV Park & Campground in a Motorhome. Easy access, no highway noise from inside the camper and only faint noise outside camper, lots of grass for walking dog on leash, excellent water pressure, good mountain views, great cable TV service, very clean and up to date laundry, very friendly owners. We will definitely stay here again. This is our 4th trip from Washington to Georgia and we've stayed at many RV parks. This one is excellent. We camped at Mountain View RV Park & Campground in a Travel Trailer. Very clean park. Interior gravel roads were easy to navigate in a 38' MH and the pull through was just long enough for rig and detached tow. Site was fairly level and probably would not have used jacks if we were only staying one night. Very few people here in early May. Rate is with Good Sam discount. Verizon coverage was OK for both phone and data. 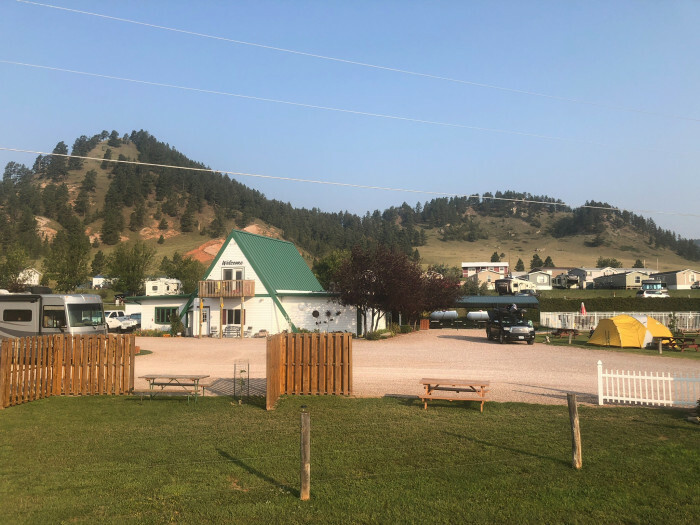 Nice place to stay and go see Devils Tower without driving the rig the additional 30 or so miles back to an RV park that is closer (road is good, just a lot of curves and hills). Satellite TV reception was good as the sites are all open with only a few small trees. Wifi connection was fairly decent for an RV park, though we were just about the only ones here so if more people were on it I would guess it would really slow down. Supposedly they will be getting a fiber optic connection soon which would give them blazing fast speeds. Staff was extremely friendly. We camped at Mountain View RV Park & Campground in a Motorhome. Stayed 2 nights and as we didn't want to unload car from tow dolly had a space that was ample for that. Wifi not working at all in park had to go to office but was suppose to be fixed later in week. New owners are very nice and since park was listed as Passport America but wasn't they gave us cable (2.00 per day charge) free. Was very clean. We camped at Mountain View RV Park & Campground in a Motorhome. This is a clean and comfortable park under new ownership. The site was spacious and an easy pull through. The park was not crowded when I was there, only 1 other camper on the upper level most nights. Lower level back-in's had 4 or 5 RV's. The park has a well-stocked store with basic items, coffee, ice cream, and simple food. I used the laundry facility and it was clean and well maintained. $2.00 per washer, $1.50 per dryer. The restroom was clean and well maintained. Several shower stalls and toilets were located in the Ladies Room and each had a 3/4 door for privacy. Sinks were communal. This was a good choice to stay given that I wanted to visit Devil's Tower, Mt. Rushmore, and Crazy Horse. Very cold 2 of the 3 nights I stayed, 27F overnight! Owners were helpful and friendly and gave great info on the attractions in the area. The site was not level but I used my Anderson Levelers with ease. They offer cable for $2.00 a day and have coaxial cable for sale in the store so I took advantage of that amenity and received about 50 channels. I would stay at this park again. Note that their water pressure is high (80 psi) so a water pressure regulator is essential for hook-up. I had my own but they do sell them at their store. We camped at Mountain View RV Park & Campground in a Fifth Wheel. The site was tight but adequate. Not very scenic but a good place to overnight. We camped at Mountain View RV Park & Campground in a Motorhome. We had reserved for two nights, but left after checking in. There was NO shade, gravel/dirt sites, and heavy winds. We could not open windows because of wind, couldn't put out awning because of wind, and a/c could not cool us because it was 90 degrees and NO shade. When I went to office to "check out", owner offered no other site. She didn't seem to care that we were leaving, so I got my credit card reversed and left. Won't try that one again. 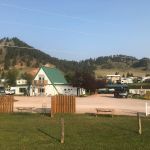 We camped at Mountain View RV Park & Campground in a Travel Trailer. The drive to Devils Tower is nice through farm land, good road, no road work. The station on the nearby corner was about $.30 per gallon higher for diesel than elsewhere in the area...be aware. Devil's Tower very close by. Serious road construction on the east side of the loop going to Devil's Tower (dirt, mud, rutts-glad we didn't have MH), which is the longest way from Mtn View to Devil's Tower. 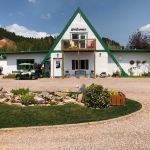 This is the place to stay if you want to visit Devils Tower NM. Sundance also has a nice museum downtown I recommend you visit. They also have a bunch of geocaches around the city - ask at the museum for a list. plenty of places to eat, grocery shop in nearby town. Devils Tower 28 miles away. A must-see. Vore Buffalo Jump is definitely worth a visit. Make sure to pay the $7 to get the guided tour. We enjoyed trip to Devils Tower and enjoyed the small town of Sundance. Devil's Tower is about 30 minutes drive and worth it. The Longhorn is a great place to eat in downtown Sundance. We didn't find much happening in Sundance, but Devils Tower is only 28 miles away. We spent the day hiking there and highly recommend visiting it. (There is a KOA campground at the base of Devils Tower that looked nice; definitely beautiful view from the KOA campground.) Spearfish Canyon and Deadwood are about 40 miles east. Wish we would have had more time to explore Deadwood. Spearfish Canyon is a nice drive. No restaurants within walking distance, but there were a couple of places that would deliver. Lunch at Cindy B's in Alladin after touring and hiking the Devil's Tower. Within 30 minutes of Devils Tower. Within 45 minutes to Sturgis. And only 90 minutes to Mt. Rushmore/Custer State Park. Right off I-90 - NO trains, NO planes, NO highway noise. A lot of folks use this park for South Dakota's Black Hills, Mt Rushmore, and the Badlands. I can't see going West to go back East again. But this is definitely the place to be for Devils Tower. Ate at Buffalo Jump Saloon in Beulah. It is WAY overpriced. Easy drive to Devil's Tower. Near Devils Tower national monument, which is a "must see." Spearfish SD and Sturgis are an easy drive and have all the shops and stores. The landscape is beautiful and back roads are wonderful to explore. Get all your supplies before coming to Sundance since the few stores all close early in the afternoons. 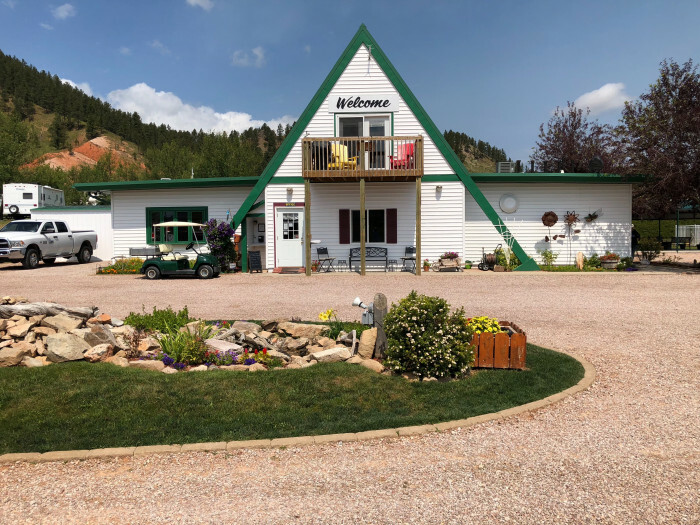 Are you affiliated with Mountain View RV Park & Campground ?